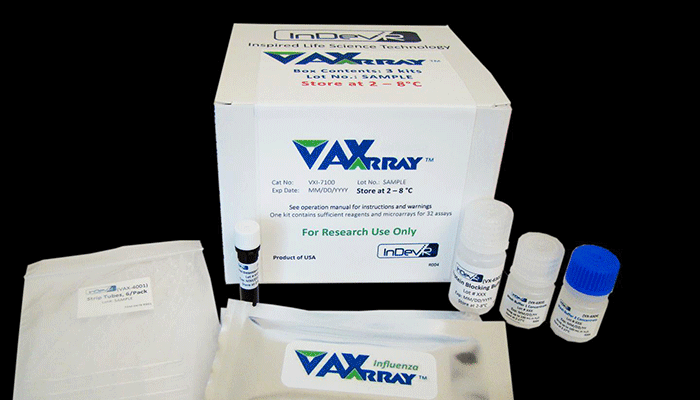 The VaxArray Influenza Pandemic Hemagglutinin Potency test. Credit: InDevR, Inc.
To enable a rapid vaccine response during a severe outbreak or pandemic, there is a pressing need for a potency test that is rapid and has sufficient sensitivity to track potency in dose-sparing and adjuvanted vaccines. InDevR has made available a new potency assay that enables rapid determination of immunogenic hemagglutinin in low-dose and adjuvanted flu vaccines, important in combating flu viruses with pandemic potential. The VaxArray® Influenza Pandemic Hemagglutinin potency test kit is now available for flu vaccines containing H5, H7, and H9 flu subtypes, which includes new H7 vaccines against the deadly avian H7N9 virus. The current gold standard method for flu vaccine potency determination, single radial immunodiffusion (SRID), can take months to develop the reference reagents needed to perform the SRID assay, which, as demonstrated in the 2009 H1N1 pandemic can delay the delivery of flu vaccine. This work was sponsored as part of the Department of Health and Human Services’ inter-agency Influenza Vaccine Improvement Initiative. Specifically, product development was supported by a Small Business Innovation Research grant R44AI102318 through the National Institute of Allergy and Infectious Diseases, which is part of the National Institutes of Health (NIH).